Welcome to “Women Around the World: This Week,” a series that highlights noteworthy news related to women and U.S. foreign policy. This week’s post, covering October 20 to October 27, was compiled with support from Anne Connell and Susannah Dibble. This week, cabinet reshuffling increased women’s political leadership in two countries: Norway and the United Arab Emirates. In the Gulf, the appointment of a new UAE cabinet boosted women’s representation to nine of thirty-one ministerial positions, rendering the Abu Dhabi cabinet more gender-balanced than those found in many other countries—including Argentina, Italy, and the United States. 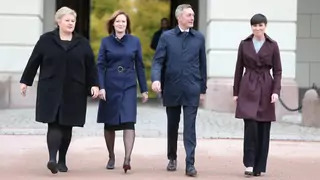 In Norway, women for the first time in history hold the highest three positions in government: Prime Minister Erna Solberg and Finance Minister Siv Jensen were joined by the country’s first-ever female foreign minister, Ine Eriksen Søreided, who previously served as defense minister. A horrific video from the Democratic Republic of Congo (DRC), showing a woman being publicly raped and executed by members of a rebel group, has renewed global attention to the continuing scourge of sexual violence in the war-torn nation. The attack occurred in the south-central town of Luebo, captured by armed rebels captured in March, who have since been ousted by the Congolese army. This violence is more common in the country’s war-ravaged east, where hundreds of thousands of women and girls—and also men and boys—have faced sexual violence by the Congolese army and various rebel groups during more than twenty years of conflict. A newly released report from the United Nations Population Fund (UNFPA) highlights measures of gender equality as “critical but under-appreciated variables” to accelerate international development and economic growth. According to the report, women continue to earn 23 percent less than men on average globally, a gap that researchers suggest will take more than seventy years to close if progress continues at the current pace. The report also finds that economic inequality within countries is strongly correlated with access to healthcare, early pregnancy and childbirth, and rates of domestic violence. The authors warn that legal barriers to women’s advancement and cultural traditions that undermine the women’s economic participation undermine global efforts to achieve the UN’s Sustainable Development Goals.